I mentioned the other week that my brother and I had done a car boot sale. Neither of us had done one for a while, although I do occasionally drop in for a bit of a nosy round in case I spot books or games for N. But we needed to start clearing out our mum’s house so we don’t get to the end of Summer and just have to store or skip everything. It was a case of working out what to sell at a car boot sale. We had an interesting time nosying at what we’d found in the roof (more on that another time) – can’t believe how much we still have to go through, but we don’t really want to just flog everything to a house clearance team for about £50. So us clearing it gradually is how we’re tackling the clear out. We decided to go to a different car boot sale a bit further away – it’s a massive one on a Saturday morning, and we were hopeful we’d be able to clear out most of the car’s boxes. It was a really hot day, and we did ok in the end, although nowhere near what we’ve done before with less items to sell. It looks like we’ll be out again this Sunday but closer to home and hopefully will manage to clear more out again. 1, Pack the car in reverse to how you want to remove items. Put tables on top, easily accessible, and a tarpaulin or blanket is handy to have items laid out on for people to browse through. Generally 2 fold out tableslength is good (we didn’t have enough). In an ideal world I’d have liked to have had U type shape of tables so we could sit or stand in the middle. You can also have boxes of similarly priced items but I find people never look under the tables. Boxes at the ends work well for similar items like books or CDs. 2, Put valuable items on show near you, and keep your money hidden. I’ve been at a car boot sale on my own, where a Discman (remember them?) was on the table, but someone moved it onto the ground, and next thing it was gone. Money belts are good, although the one we did recently, we just used pockets, then removed all the notes to a cash box as and when pockets got full. 3, Take a float. That means lots of change, denominations dependent on what sort of price you’re selling for. We went with about £19 in change and that was fine. 4, Take plastic bags for people to use. But only give them to people who are buying, unless obviously you see a pregnant lady struggling carrying loads of stuff. Most people nowadays bring reusable bags, but when I’m buying I never do as it’s usually a spontaneous visit..
5, Go with a friend. You’ll be bored stiff otherwise, and you need someone to watch the money while you’re talking or vice versa. It also helps with keeping dealers out of the boot while you’re trying to unload at the same time. 6, Generally the rule is don’t price items. I mostly agree with this, but if you’ve got a huge box of cds, dvds, similar books, then why not have a price for them. I’ve also seen odds and ends of toys in boxes with ‘any item 10p’ style sign. But mostly, have an idea of what you want to sell items for, then be prepared to haggle (or not). 7, On arrival, unless you want to have people digging in your boot while you’re trying to set up, then lock the doors and sit in the car for a while…or at least until all the dealers have gone past to the next few cars pulling up. You could end up with people unpacking and scavenging in your boxes before you’ve got an idea of prices. These people will offer silly money because a lot will be looking for items they want to go off and sell on their pitch. 8, Arrive a bit before the opening time advertised. Car boot sales always used to open gates earlier for sellers but that’s rare now. So the gates will generally be open before the stated time, with buyers and sellers able to enter together. 9, Take seats, sun lotion, drinks and snacks. You don’t want to eat all your takings, get sun burnt (you will in any weather after standing around for 4+ hours) or get dehydrated. I find people prefer to approach and talk to sellers when they’re standing up, but my legs get tired so I like to have a break occasionally. 10, Don’t be surprised at what sells. My experience is, the items you think won’t go, will be the first to go. Our comedy item this time was a purple immaculate Fiorelli purse. It must have been the most picked up item on our table. Pretty much every woman picked it up, and some men. In the end we asked someone why they’d picked it up as everyone else picked it up but didn’t even ask the price. She asked the price, put it down to pick up her purse, and someone else picked it up. Turned out it was her neighbour and they ended up arguing over who would have it. We were determined to sell that purse, but just couldn’t understand why it wouldn’t sell. But then we had some old model fix made up aeroplanes from our dad’s childhood that my brother brought along on the off chance, and they were snapped up – all 4 boxes of them! 11, Be prepared to visit the charity shop on the way home. If you want to just get rid of everything, then be prepared that it might take several trips, otherwise we detour home via a charity shop and then the tip for anything that we know just will not sell at other sales. 12, Allow for price reductions for broken or chipped items, but people will still buy depending on what the item is, the age, or if it can be washed. I had a dealer about to buy a Kipling handbag which had a dirt smudge. He wouldn’t take it even though it would have washed fine. The next person to pick it up bought it without haggling, saying she’d just put it through the wash.
13, If things are a bit quiet, try talking to people who approach. Most buyers keep their heads down, lots don’t come over. But if they’re coming and touching items, and you’re talking to them, it makes it harder for them to put an item down. Shoes – dependent on size (we had size 6 gorgeous brand new Gabor boots and no one was the right size), although my old dancing character shoes were snapped up. Records/CDs – in the past I’ve struggled to sell any, on this occasion, it was what people were asking for as we stepped out of the car. Clothes – I don’t like scrambling through clothing, if it’s on a rail, you’ll sell more. China/crockery/ornamental display items – everything depends on the buyers. We had a lot of decorative plates. Way more than charity shops would want, so we thought we’d be tipping them afterwards.Then a chinese couple turned up and grabbed a stack of around 15 oriental style plates. My brother told them 20p a plate (ridiculously low price) or £2 the lot. So they snapped those up, along with another two stacks of decorative ‘tea’ plates for another £2. My brother just wanted rid, and it certainly made the car more fuel efficient on the way home. But that was lucky, and that’s how it goes at car boot sales. As this became a mammoth post, I’ve done a separate post on having a successful car boot sale as a buyer. 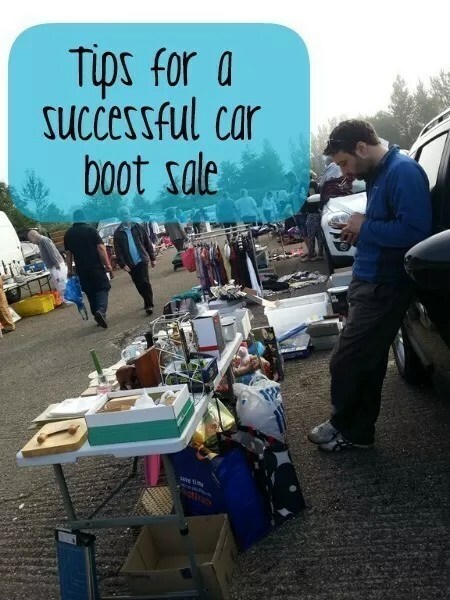 Hopefully you’ll be able to use these tips if you’re selling at a car boot sale.. I had never done a car boot sale until I was off work and keen to make the most of my free time, whilst de-cluttering and making some extra pennies. I have been quite successful with the 3/4 I have done. Stand for the duration- work for your money! Create height- don’t just lay everything out on 1 table flat-use a box to raise some products and draw eye level up. Pkus who knows you may end up selling the box- no rhyme or reason for what some people buy. I don’t do dirt cheap at car boot sale- I have nice things from years of sweet discounts at Anthropologie, The White Company etc- so I always think if I would buy it again for that price then it’s too cheap. It has certainly left me with people saying- ‘your too expensive’ and ‘this is car boot sale- not a shop’ – but I don’t care, I like my stuff, I’m not giving it away. On the other end of this I have customers who give me there number and I text them everytime I do a stall, so that they can come and see what I have brought that time. Oh and great point about bringing food and drink- the first one I got robbed when we were thirsty and hungry and had to succumb to the over priced greasy crap thats sold at ours. Thanks for your great comment Victoria. There’s some great tips here. There’s definitely certain things I won’t budge on. We had a pair of brand new knee length Gabor boots in size 6 for sale. When they retail for over £100 there’s no way I was accepting less than £15 for them. People were trying them on and loving them, but wouldn’t pay even a tenner. We took them home and donated them to the charity shop. I’d rather do that in some cases than give them away to ungrateful people! 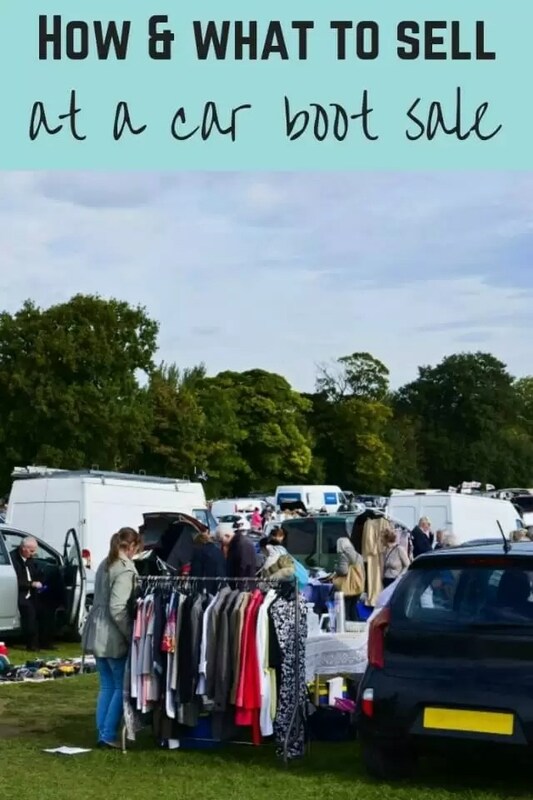 Great tips – haven’t done a car boot sale for years though, the pickings got a bit rubbish around my way, and people wanted something for nothing – even haggling down a 20p item – come on?! I often used to do them with my sisters, and we would have bets on what would sell and what wouldn’t. It made us laugh when things we didn’t think would have a hope in hell of selling, actually did! Don’t do what I did once, and that is get caught in a speed trap on the drive home (genuine mistake for me) and then have to pay out a fine!!! It sounds just like my experience really. IT’s always the freebies or the cheapo rubbish that goes, and then you’re left wondering why others don’t. I had a brand new pair of size 6 gorgeous Gabor long boots – bog standard size, gorgeous (just didn’t fit me – they were my mum’s), asking a tenner, and people kept looking but wouldn’t buy. A pair of £100+ pair of boots that they could have just sold on ebay. They went to charity shop in the end, I was gutted because I just didn’t have time to ebay them. And yes, the haggling drives me nuts because it’s not even fair haggling. Oops to the speed camera. I’ve locked myself out of my car at a car boot sale once. Luckily my friends who had the car next door had a phone and I was only 8 miles from home, but the OH was not impressed! I haven’t seen an event like this in my city, but I will be sure to look for it! It seems like a great way to get rid of things you don’t need anymore! Definitely a great idea. 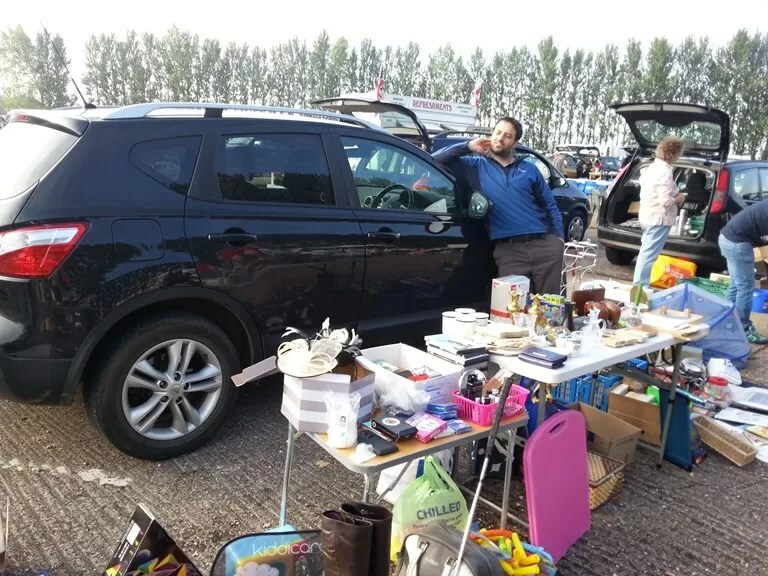 And great to organise if you want to raise money for charity – just charge for a seller’s pitch – we reckoned the one we did this weekend must have make close to £1k as they charged £6 a pitch, and must have had 150 cars selling. What fun and great way to get to de-clutter your home. Not bad that you get to earn some extra cash too! Any way to get extra cash is good, although it does take a lot of time. There are some really good tips! I sell a few things here n there but mainly donate everything. It is just easier to give it away sometimes. I agree. Sometimes so much easier. There’s only one place in town that has parking outside though, so isn’t as easy to donate to a charity shop as it could be. Luckily the clothes banks/recycling at supermarkets help sometimes. Yep, just like a garage sale, but everyone just sells from their cars in (usually) a field. I have never even heard of a boot sale! Awesome tips and advice. Now I want to join one. They can get quite addictive, although they can take a lot of time up if you’re selling. Great tips! I’ve never tried anything like that before and we are pretty good about clutter. Maybe we’ll find some to go to now and compare how they are doing to what you recommended above. Guess there will be some variations, depending on location – especially on the level of haggling, but always an interesting experience. 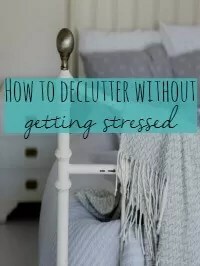 I think I need to go through the clutter free stage! I am not sure I would be doing a car boot sale anytime soon, however the tips are great for any kind of vending setup. These are great tips!! Toys also sell well too. omg this looks fun! i have been to one of like these too in the past and i must say that it looks fun and really bought a lot of cheap stuffs! If pricing the items is not advised, then the seller should be ready to answer the interested buyers over and over again. That may be tiring but the task may be worth it in the end. It’s all about having the skills to engage with customers and negotiate right prices. Exactly. Although a lot of buyers don’t even ask – bit British in that reservation – so sometimes I think pricing (although not the etiquette) would be better for the British culture! Then people wouldn’t need to ask. I haven’t heard of this kind of sale, but the tips would go for most any sale. My in-laws sell crafts at the pow wows and I was thinking of them all throughout the reading. I haven’t heard of Pow wows, I guess it’s like a jumble sale? Community sale type of thing? After graduating from university, I was very, very poor. I sold pretty much everything I owned before a big move. It took about a month- a boot sale would have been PERFECT for me! I wish I had thought of that!!! What a great way to spend the day! 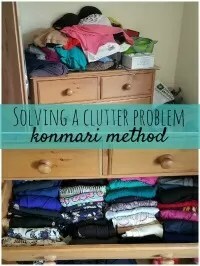 It’s definitely a great way to get rid of lots of stuff in one go (or maybe too depending on the size of your car and amount of stuff to sell!). I always find that online selling takes ages and is really bitty with having to post at different times. Yes, just the same in terms of learnings and tips. I have never heard of a car boot sale. But from this post its like a swap meet or garage sale but just from your car with a group of other people. This is such a great idea. these must be a new phenomanon, I have never heard of these sails. only trunk or treat at halloween. I have never heard of a car boot sale. 🙂 It looks pretty similar to some of the sales my mom signs up for — you can bring used or new items. I used to make so much money when I was younger at these, bringing my old toys and other collectibles. It’s a fun time! This is my first time learning about a car boot sale. It looks really interesting. Some good advice on how to make it worth while. Very interesting, I’ve never heard of a car boot sale. I’ll have to try it! I have never heard of a “car boot sale”. That had me hooked and I had to keep reading. I tend not to sell much in that fashion. I’m more of an online seller, but good article. I’ve never done things like this before, though I could imagine the many things you could find at a place like this. I have never heard of car boot sales before! I have only ever been to yard and garage sales. This seems like a fun thing that could be started in my area! We hardly ever go to car boot sales even though i know the kids would love it. I think it is because we have too much stuff already and we’d end up buying too much more! My mum was a big fan of car boot sales and we used to go with her regularly – Amazing what bargains we picked up. I love a good car boot but we haven’t sold stuff ourselves before – perhaps something to try. I’ll be sure to be back to remind myself of these tips if we do! This seems like a very interesting alternative to a garage sale. We’ll have to take this into consideration next time the family wants to get rid of stuff from around the house! I’ve never heard of a car boot sale! what a great way to get rid of some things and make a little money! What a great idea. I wish they had those around where I lived. I have a lot of things I can sell. The headline caught my eye. I had to find out what exactly a Car Boot Sale was. Never heard that term used before now. I just learned something new. Thank you for the tips and hints. Will use these next time we have a yard sale or garage sale. I wonder if they do anything like this in the states. It sounds like a community garage sale. It is a bit like a yard or garage sale. Just more people involved and in a neutral space. I find to that china, glass and crockery is a pain because it all has to be wrapped and unwrapped every time, while a container of utensils can just be set out. Yep, that’s right. Crockery’s a real pain, especially if they’re boxed up pieces. Getting them out and packed again is annoying when they don’t sell. This sounds like a great way to declutter and make some money in the process. Thanks for the great tips! Sounds like a good idea! Its like a garage sale, only with more people around. A good way to get rid of old stuff! I think the group setting definitely pulls more people in. Car boot sales are great for bargains if you don’t mind getting up early! That’s it. The 6am start wasn’t great. 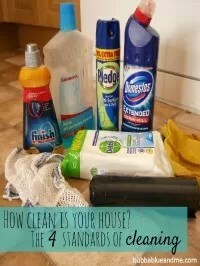 This is a nice way to unclutter the house and also raise money. The tips are really helpful especially the securing of the money collected. We usually have a fall garage sale.. it really is amazing as to what sells and what doesn’t.. everyone is also always looking for everything for nothing..
That’s what would be great, a whole street doing it. Hope you get one done before the end of summer then. My family always had garage sales growing up, and we loved going to see what other people were selling. It was so interesting seeing what people wanted to buy and what was left at the end of the day. We always made quite a bit, at least enough for a nice dinner, and then donated anything that wasn’t purchased. It’s always satisfying to see people part with cash for your cast offs. My brother and his friend always tried garage sales for their ‘get rich quick’ schemes. Didn’t always work up a cul de sac on the edge of a village.